Baking soda is a kitchen staple that can work wonders on smelly and clogged drains. The most common clogs in kitchen drains are from fat, oil, and grease. For bathroom drains, hair and scum from personal products most often form the clogs. Baking soda, or sodium bicarbonate, is a naturally-occurring mineral compound. A slightly alkaline powder, it can dissolve mineral deposits and organic materials such as grease, which is slightly acidic in composition. Additionally, baking soda has slight disinfectant properties that can combat odor-causing bacteria and fungi. Using chemical drain cleaners has many drawbacks. They are not guaranteed to dissolve clogs and the caustic chemicals can be extremely hazardous to skin and can even cause serious burns. Professional plumbers usually caution against the use of these products and some apartment buildings expressly forbid chemical cleaners. Before reaching for a caustic chemical product to unclog a drain, give baking soda a try. Weekly, flush drains with boiling water mixed with liquid grease-fighting dish soap, such as Dawn. Clean your drain with baking soda as soon as you notice the water is draining slowly. You can also use this process as a regular maintenance method for your drains. For example, if you keep a box of open baking soda in your refrigerator to absorb odors, use the old baking soda to flush your kitchen drain when it comes time to change the box. Follow these steps when you see your drain is running slowly. Heat boiling water in a tea kettle on the stovetop or in a large pourable measuring cup in the microwave. Squirt a bit of grease-fighting dish soap into the drain and carefully pour the boiling water into the drain. The dish soap will help dissolve greasy clogs. Pour 1 cup of baking soda into the drain. You can use a cup measure to do this, or use a funnel if you have a smaller drain and too much baking soda ends up in the sink instead of the drain. Pour 1 cup of distilled white vinegar into the drain. Don't be surprised by the audible reaction that occurs. Baking soda is an alkaline substance and vinegar is a mild acetic acid. When the two are mixed, they react somewhat dramatically to neutralize one another and the fizzing action you hear is the reaction that will often dislodge clogs in your drain. After the fizzing subsides, wait five minutes. Use this time to heat 2 cups of water to boiling. Flush the drain with the boiling water. If the drain is draining, run hot tap water. If it is not draining, repeat the steps. If this is the first time you have cleaned your drain in a long time, it may be necessary to repeat the baking soda flush at least twice. If the baking soda and vinegar method doesn't unclog the drain, use the salt and baking soda method next. This works best if you do it right before bedtime since the drain won't be used until morning. Pour 1 cup of baking soda into the clogged drain. Follow the baking soda with 1/2 cup of salt poured into the drain. Let this mixture sit in the drain for several hours—overnight is best. Heat 2 cups of water to a boil. Pour the water into the drain. If the drain begins to drain, continue to flush with hot tap water. Always use strainer baskets on your drains to keep hair and food particles from going down the drain. Never pour oil or grease down the drain. When cooking greasy or oily foods, wipe the cookware with a paper towel before washing so less grease, oil, and fat go down the drain to form a clog. Regularly add boiling water with a grease-fighting dish soap down the drain to prevent the buildup of greasy clogs. 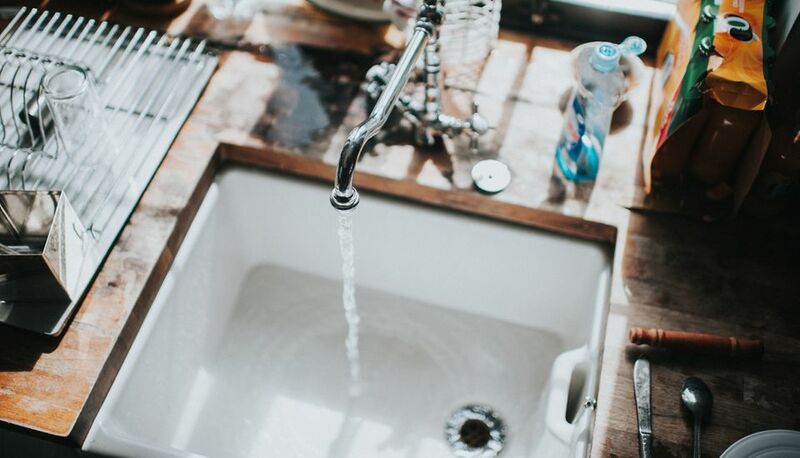 Freshen your drains by adding 1/2 cup of baking soda to the drain and allowing it to sit overnight, then flushing with hot water or hot vinegar in the morning. Both the baking-soda-and-vinegar and the baking-soda-and-salt methods can be used to clean and freshen your garbage disposal. To remove odors in a disposal, reduce the required amounts of baking soda, water, vinegar, and salt by half and follow the directions above.